Josef Freiwald was born in the Canton of Wallis, his mother was a Sintezza, his father a Yenish. The authorities registered him as Swiss citizen. Later on, Freiwald worked as an acrobat and musician at the Circus “Krone” in Munich, before he moved to the Netherlands, where he played music in cafés and started a family with the Sintezza Carolina Basily, who came from a family of Italian artists and musicians. With the beginning of the German occupation in 1940, Freiwald several times applied at the consulate for an official confirmation of his Swiss citizenship, but the Swiss authorities refused to issue a passport, since he was born to an unmarried mother and classified as “Gypsy”. 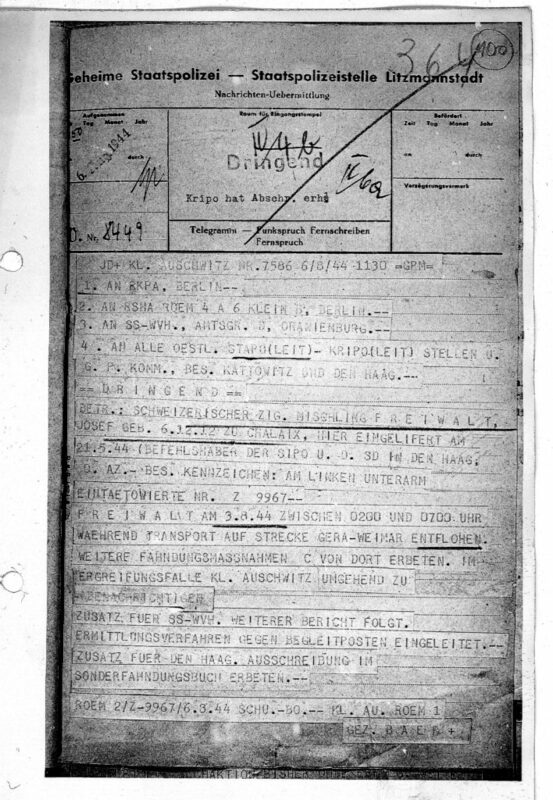 Deprived of any protection, Freiwald was arrested in spring 1944 and taken to the transit camp Westerbork. His wife and his three children were relieved, since the Italian consulate intervened for its citizens. In May 1944, Josef Freiwald was deported to the concentration camp Auschwitz-Birkenau, where he received the inmate number Z-9967. Shortly before the liquidation of the “Gypsy family camp” on August 2, 1944, in the course of which the remaining 2.897 inmates were murdered in the gas chambers of Birkenau, Freiwald was selected for forced labor at the concentration camp Buchenwald. During a stopover of the deportation train, he managed to escape. After three months in the underground, he was apprehended and transferred to Buchenwald. After his liberation, Freiwald returned to the Netherlands. Even after 1945, his efforts to regain the official Swiss citizenship remained unsuccessful. Huonker, Thomas; Ludi, Regula: Roma, Sinti und Jenische. Schweizerische Zigeunerpolitik zur Zeit des Nationalsozialismus. Zürich 2001; Memorial Book: The Gypsies at Auschwitz-Birkenau, vol. 2; Archiwum Państwowego Muzeum Auschwitz-Birkenau w Oświęcimiu (Archive of the State Museum of Auschwitz-Birkenau in Oświęcim, APMO), IZ–8 (Gestapo Lodz), 4a, No. 155917.